Made of shatter proof high quality acrylic, the shower mirror adheres to virtually any wall surface with removable silicone adhesive that will not damage tiles or shower walls! The easily adjustable bracket accommodates multiple users and angles. Built-in shelf stores your razor, sponge or tweezers. The mirror conveniently detaches from the bracket so you can easily fill the reservoir before each use. A self-stored squeegee is included to wipe away excess water drops from the front of your mirror. To use: Simply slide the mirror off the bracket before each shower and fill with hot water. The hot water will keep the mirror the same temperature as the environment in your shower which makes it scientifically impossible to fog. Filling the reservoir takes only 5-7 seconds. Designed not to rust, discolor or damage bathroom surfaces. We also carry lighted and travel versions. If you are not satisfied with your purchase we offer a 100% 30-day money back guarantee. That's how confident we are that this will be the last fogless shower mirror you will ever have to buy. Dermatologists always recommend performing your daily skin care regimen in the shower to help promote healthier looking skin. The combination of heat and moisture opens your pores and creates the best environment for shaving, exfoliating, tweezing and cleansing. Look your best by taking care of your face in your shower. By simply filling the back of the mirror with hot shower water keeps the mirror fogless GUARANTEED to be fogless for life. Requires no annoying fog free sprays EVER! Easy mounting with removable silicone adhesive and double sided tape. No more unreliable suction cups! 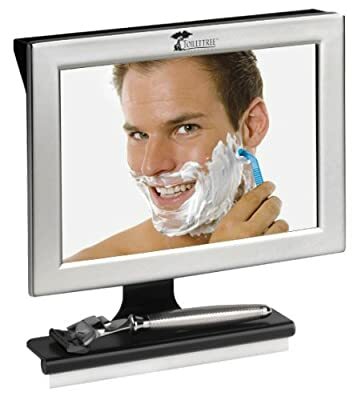 Built in squeegee to clean off mirror after filling with hot shower water Convenient shelf to place your razor, sponge or tweezers so they are always accessible.